Thank you for using IndexDeconstructor for Microsoft Word! 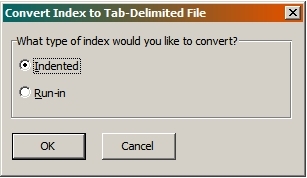 IndexDeconstructor turns a previously formatted back-of-the-book index into a tab-delimited file that can be imported into a standalone indexing program such as SKY Index, CINDEX, or MACREX. IndexDeconstructor is also included as part of DEXembed. You can download the IndexDeconstructor User Guide by clicking here. Try IndexDeconstructor free for 45 days! Download IndexDeconstructor for Microsoft Word 97, 2000, 2002 (XP), 2003, 2007, 2010, 2013, or 2016. Download IndexDeconstructor for Microsoft Word 98, 2001, X, or 2004. Is your evaluation period over? Register IndexDeconstructor and make it run forever!